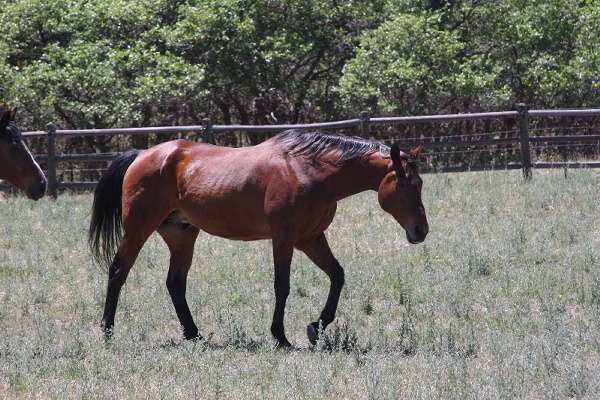 Trixie is a 36 year old quarterhorse mare. We met Trixie in summer of 2008 at Dreamcatchers Equine Rescue, we were there to see how they ran things at their facility as we were considering starting The Lacey Foundation. As we walked by one of the paddocks, this sad looking horse just fell to the ground, we stopped to see what was going on and the horse fell a couple of more times. I asked about her, and was told she was an older mare, that had been surrendered by her former owner with another horse. Her name was Trixe and she was 33 years old, they said when she arrived she had a blanket on her and when the blanket was removed, the vet was called immediately. They were sure she was going to die, she was severely underweight and in really bad shape. Trixie was put on a diet of mash, because she lacks the teeth at her age to grind hay or grass down enough to get any nutrients from it. She was in that paddock so that they could give her mash twice daily, but I knew we had an empty pasture at home so we asked if she could spend the rest of her days at our ranch in a pasture, that way she could be a horse for what we were sure would be her last few weeks. We brought her home three years ago, and even our vet was sure she wouldn’t make it through that first winter. Trixie has surprised us all; she survived that winter and continues to enjoy her retirement here at The Lacey Foundation.